What if you could make every single customer feel like the most special person in the room? That’s where direct mail solutions come in. Receiving a printed piece in the mail has stood the test of time. We say there’s no point in messing with a good thing. Whether it’s a singular postcard or an intricate pop-up cutout, direct mail has the opportunity to completely enthrall your audience. All you need is a foot in the door, and direct mail solutions might be the step up you need. Think back to the last time you got something truly moving in the mail. Maybe it was the message, the color or the shape that caught your eye. This may be your opportunity to provide just that—an experience. Postcards are now so much more than simply documenting your travels. Postcards have the ability to capture the hearts of your customers in a short and sweet manner. Pull their heartstrings without the ticket to a faraway land. Instead, show them how sweet it is to stick around with a company like yours. So what exactly do Bulk Mail Services entail? Bulk mail services involve sending a large quantity of the same promotional piece to a large number of people. What makes us different? We can get the job done all while making each of those recipients feel unique and special. The rules and regulations are hard, so let us worry about that. We know the right processes and have the proper tools to make sure your bulk mailing goes out on time and is effective. All you need to worry about is who you’ll be sending the mailing to. With the rise of everything electronic, snail mail has an opportunity to stand out. Direct mail can be that special piece worth writing home about… literally. For best results, make it personable unique. We can fold, seal, stamp, tab, presort and even address the concerns you didn’t even know existed. 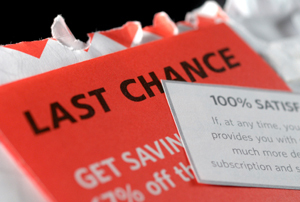 Give our direct mail solutions a chance to totally rock your world.